As a tool for local board members (that are not yet a client of VF Law), we are happy to provide a complimentary chat to help you navigate community life! We are not the lawyers that give abstract and unusable analysis of the law full of legal jargon. VF Law will speak in plain English so that your board can understand, and we will provide the practical everyday advice that you need! 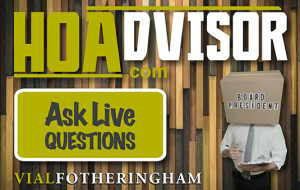 For a free chat with an HOA advisor, click on the provided link! *Note: For non-client board members only. To offer the best assistance for planned communities contacting us with issues, we can only answer general questions from board members, directors, and managers. This avoids conflicts of interests and allows us to educate those in charge of the HOA, so they have the tools to run the community with the highest level of knowledge and efficiency possible. If you are an owner with a question, please email us at HOAdvisor and we can refer you to another firm that will be able to help you.